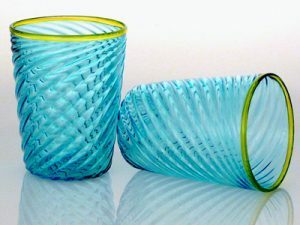 These colorful tumblers are inspired by the blue waters of the Caribbean. 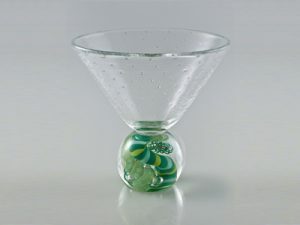 The body of the glass is a transparent turquoise blue and complemented with a chartreuse lip. 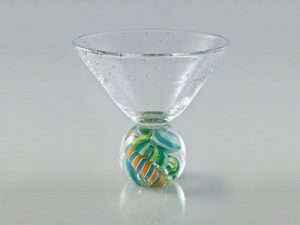 Enjoy a refreshing beverage on a sunny day with these island inspired glasses. Sold individually. 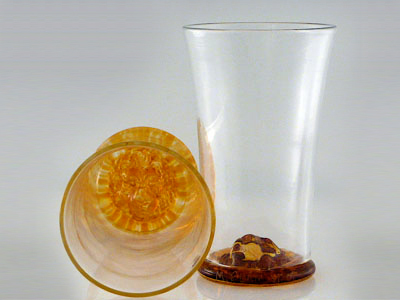 These Scotch influenced glasses can stand up to the finest aged whiskey ever poured. 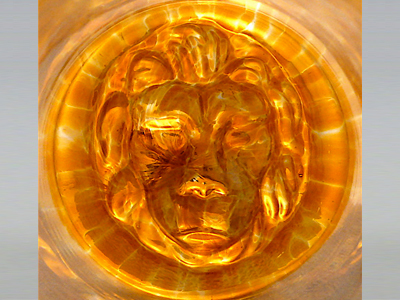 A clear elegant flared cup is fused by heat to a topaz transparent lion base. Fill with your favorite beverage, and enjoy a cup of courage. Cheers! Sold individually. A variety of glass canes are woven together in various shades of blue. Each marble is unique. Individual patterns and colors will vary. 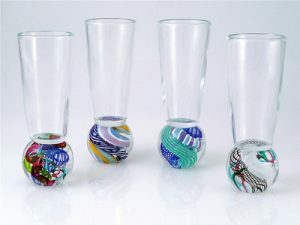 Glass canes are woven together to create a beautiful variety of colors and patterns. Each marble is unique. Individual patterns and colors will vary. Black and white lines run through the marble base and the cup has a small bubble trap grid pattern in the wall. Very classy and rare. 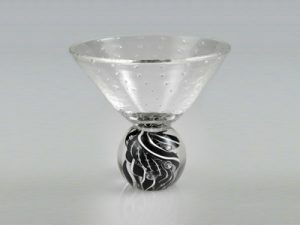 Serve your martini's in a matching Martini Mixer with a unique glass cane handle. 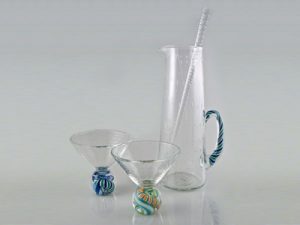 The pitchers handle is created by blending rods of different colored glass. Cheers! 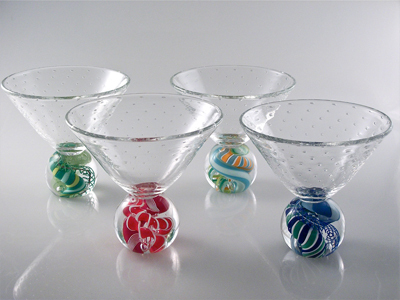 Each mixer handle is unique, the color and patterning will vary. Martini glasses not included. 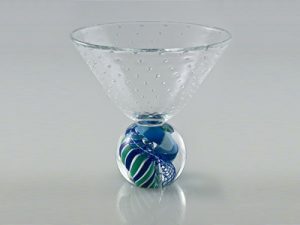 Holds 5-6 Martinis comes with 14" clear stirring rod. Perfect for Limoncello or Ice Wine, these versatile glasses hold any favorite concoction. Each marble is unique. Color and patterning will vary, as shown in the image. Sold individually. 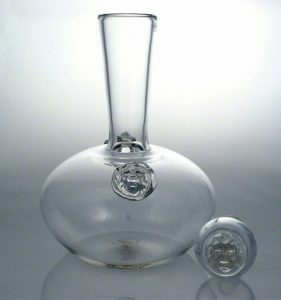 Classic Wine Decanter holds a 750 ml bottle of wine. 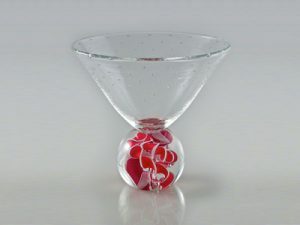 This classic shape is designed to maximize the flavor and bouquet of your favorite wine. The Lion mask stamp is present on this vessel to encourage bravery and remind people of Venice, the original port of call in the west. 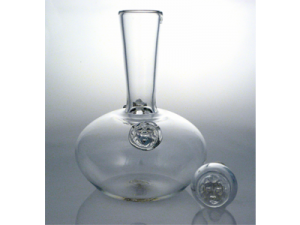 Includes a 3" matching hand *blown glass* stopper with Lion mask detail.